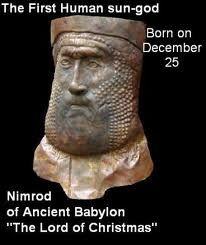 The name Nimrod is theorized to originate from the Akkadian god of war and hunting, Ninurta; he was also called “the Arrow” and “the Mighty Hero.” 20 Ninurta, as it turns out, was a Nephilim son of Enlil and Ninlil. 21 The symmetry to the meaning and its origin would tend to lend credibility to its accuracy, particularly if Nimrod did view himself as a Nephilim, at least in ambition. Meanwhile, the Hebrew translation for Nimrod provides the balance to the allegory of his name, for it translates as “rebel, to rebel against, brave, and to subdue.” 22 By fusing the definitions from the different cultures, languages, and religious perspectives, we arrive with a complete definition, personifying the allegory of Nimrod. He was a great warrior king/potentate who modeled himself after the Nephilim from antiquity. He was incredibly brave and proud; Nimrod’s hubris led him to subdue the people of Shinar through tyranny, while inciting the people of Shinar to rebel against the true God of the universe, just as his antediluvian role models did.